Outlandish Observations: Have you tried to get others to read the books? The August poll asks the question, "Have you tried to get other people to read the OUTLANDER books?" I'd like to hear your stories. 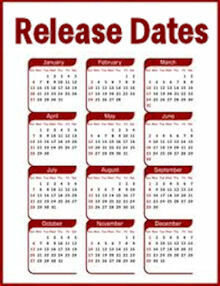 Have you managed to get your spouse, boyfriend, or other family members to read the books? What about friends or coworkers? What about those of you who won a box of OUTLANDER paperbacks from Random House (pictured above) to give away to potential readers? Did you have any luck getting people to read the books? I've broken my book club. It's an online one, and since I introduced them to Outlander I haven't heard much from them, apart from an odd surface to inform me of which part of the series they have reached, and to make lots of exclaiming noises! Thankful to say they have all fallen in love as much as me. Was pleased Diana posted the chronology of all related stories so I don't need to field the question continuously. I do like getting the odd pm, usually screaming OH MY GOD!!! Yes, I tell everyone about the books. 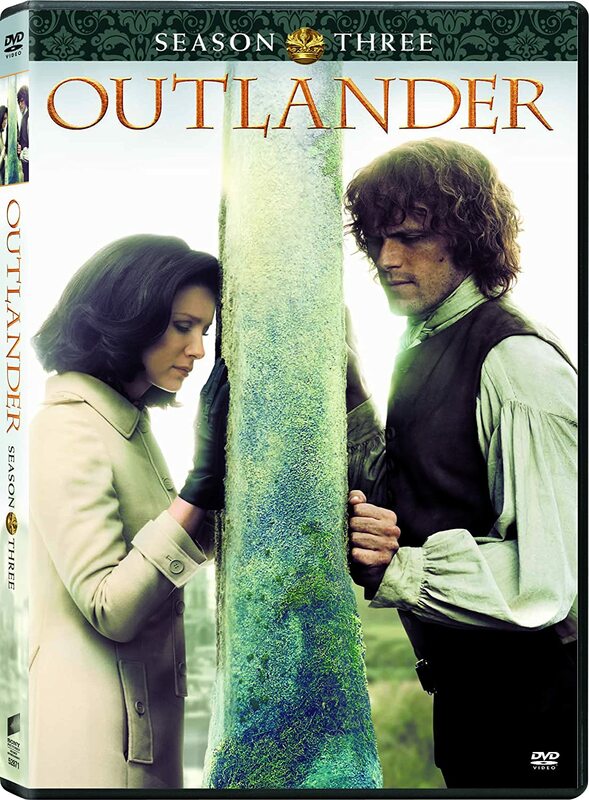 I practically forced a lady to buy Outlander at the used book store one day and often wonder if it hooked her. Only one friend said "ehhh" and didn't finish it. One person I wasn't sure about, a friend who writes non-fiction history books and never reads fiction, loved it and read the whole series. I've tried to get many to read the books (even guys), but so far, not many have taken me up on my offer. I think the size of the book(s) scares them off, no matter how much I rant and rave about the books. I won't stop trying to push, er us, recommend the books to others. I know it too my mom a couple of tries to get me to read them and I can't thank her enough for keeping at it. I have given copies twice and both times later learned the person immediately went out and found the remainder to buy or to borrow at the library. It isn't easy to just describe and rave about them as much as share the book to get the point across. And it keeps on giving when they find out how many more exist! I mentioned the series to my old college roommate recently in a Facebook conversation recently and she said said she "got chills" when she went to the Amazon page and read the description. I presume she will have read them all in the next year. I participated in the Random House give away of ten books. I had good luck as at least three of the recipients were hooked. This was/is an excellent program and I urge others to get involved with it if it is still available. I gave away the books over a six month period and was very pleased to be selected as a "donor." I just purchased a copy of Outlander for my sister. I'd earlier given her one of the free books but she didn't read it then. She's promised to read it now and I have hopes of getting another convert. I won TWO boxes of Outlander for a total of 34/35 (can't remember if it was 24 or 25 in the first box) and have mailed copies all over to everyone in my address book who I thought would read it...haven't heard back from ANYONE :(. I lent the first 4 to my SIL once and she oh read O and said (I quote) " I HATED it". *sigh*. 21 years and not doing very well. My MIL read them along with me and loved them though...was sad reading the last one without her. I think one of DH's coworkers DID go on to read more after her free copy from me. Yes, I've gotten friends and family into them, currently DH is reading Voyager and it cracks me up how he keeps referring to Jamie as "perfect Jamie" :) He really enjoys the books, but he only reads about 1 a year - he savors them, which I'm glad to see. I got four of my co-workers to read Outlander. They all liked it, but only one enough to read the other books. Unforunately, she read them out of order, so she was often confused and frustrated by the plotlines. I've tried numerous times to get my sister to read it and she keeps promising she will, "When I retire. I got my sister addicted to Outlander and two of my good friends just by talking to them about it. I tried to get my book club to read them, but only two members out of six (not counting me) actually read the book that month. One liked it, the other didn't. It was rather frustrating, the size of the book scared the other four from reading it. It was a disappointing book club discussion. I myself love the size of the books, I like to try to read them slowly to get everything I can out of them. Husband, 2 coworkers (loaning Outlander to another tomorrow), at least 15 friends and several relatives. Just a couple friends and relatives did not get hooked, and it is interesting that those who did not, were unhappy in their marriages or even separated. Hmmm. Given it as a gift many times--Amazon & Audible know me well. Well, the list is long and distinguished. First of all my niece/best friend -- once I convinced her to read Outlander (to which she later replied, "Why did I wait so long! ", I let her catch up to me (in Drums), and we simu-read from then on (assigned pages/chapters, then recapped, then assigned more, etc). Next it was two of my co-workers and now a third with a new Kindle -- she's looking for "a good book" to add to her growing library. "Good book." Sheesh!! What can I say. Then a young woman who was browsing the Gabaldon section in the book store. 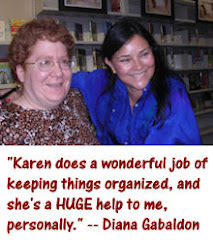 I encouraged her to start with Outlander. Not sure if she did, but I hope so, and I hope she became obsessed. My one holdout is my dear husband who just isn't much of a reader, but every so often I will get him alone and read a special paragraph or two (you know the kind I mean). He once said to me, "You've read that one before," to which I respond, "Yes, but isn't it a good one!" This is fun, Karen, thanks for this month's poll. I found out my aunt reads them. 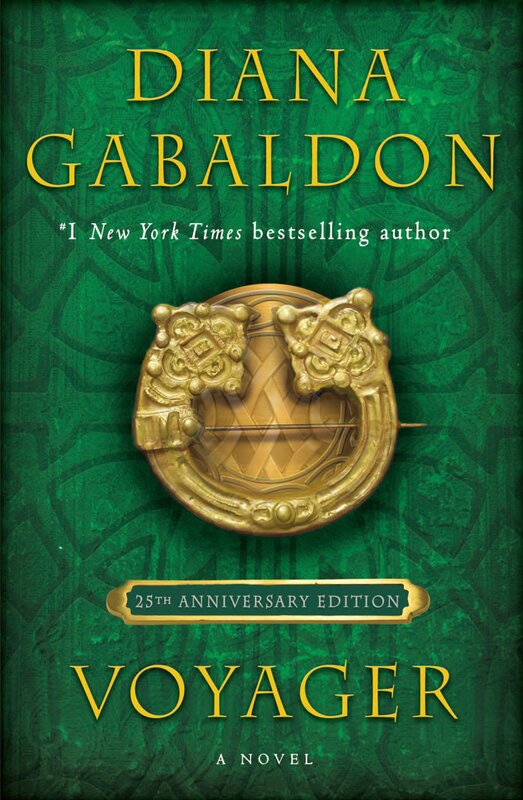 I tried to get my sister to, but she has only made it to Voyager, right before Fergus gets his hand chopped off (I keep telling her good stuff is coming, I don't get how she can stop?!). My best friend picked up book one but because of the ending (she's particularly religious) she has a hard time moving to book two even though I told her that sort of stuff is over. I wish I knew more people that read it so I had someone to talk about them with in real life! I had several friends collectively urge me to read Outlander. I felt it only right to turn around and encourage another friend (and now hubby too!) to read the series at every turn because no other book series have captured my attention so wholeheartedly except Harry Potter. My sister unbeknownst to me is now reading the series, and it wasn't until she visited me recently that I saw what she was reading. I have told her that when DG is done writing the series (book 9? ), we need to take an Outlander tour of Scotland together. time on compuserve (still do) and now I can share it with the people closest to me. It is very rewarding. Oh yes, I have! I persuaded one of my daughters, my sister, and at least two friends to read Outlander and watch the first season on Starz. It was driving me a little crazy to read such a good, fun book and not having anyone to talk to about it. I am a divorced 64 year old woman, still optimistic about finding mutual love, respect, and passion. There are so few books with such long term great relationships. Thank you, Diana! !